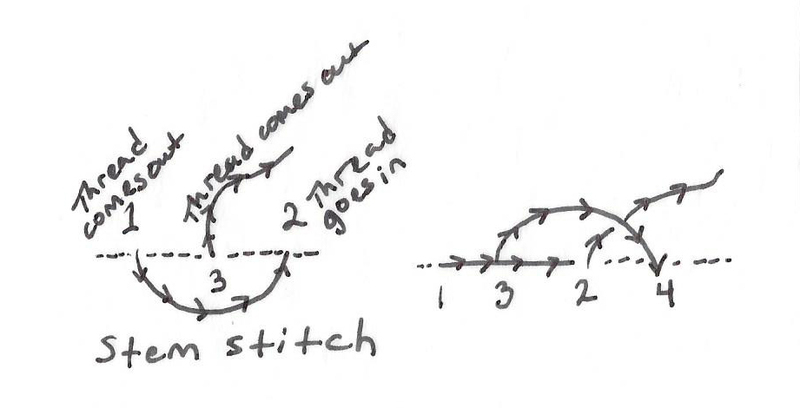 Purpose: In this class you will learn some very simple stitches: counted cross stitch, stem stitch and split stitch. 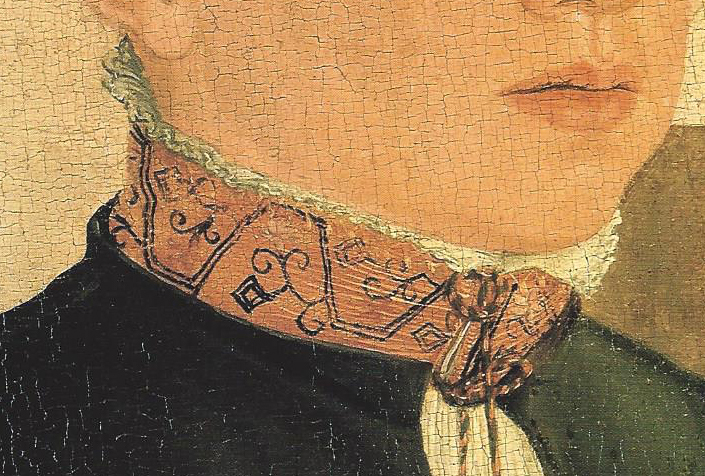 You can decorate your 16th century German clothing in designs made from these stitches. The source of the patterns used in class is the “German Renaissance Patterns for Embroidery” book which is a facsimile copy of Nicolas Bassee’s New Modelbuch of 1568. The embroidery patterns in this book were used to decorate collars and cuffs on women’s linen chemises as well as scarves worn over headdresses and brustfleks, a band of material worn across the bust in late 15th – early16th century clothing. At left is a sample page from the book, Plate 56. This image is actual size. These designs are among the least complicated. I chose them because this is a beginner class. At the top of the page, you will see a man in a foolscap. This is a popular German theme that you will see in many woodcuts. Thread – Period threads are silk and wool. However, DMC cotton works just fine if you’re not putting a piece into competition and you want to save money on materials. There are also metal threads, which are outside the scope of this course. Please note that many colored threads will bleed if you get them wet. If you are stitching on something that you intend to wash, you might want to wash the threads in warm soapy water first. The dyes are not as stable as they once were because the use of heavy metal (poisonous) mordents has been outlawed. Cloth – Period cloth is wool and linen. Today we are using linen. I recommend pre-shrinking linen before you embroider it. Scissors – You need scissors to cut your thread. Please don’t use your good scissors to cut metal threads. You will ruin your scissors. Hoops/Slate Frames – Using a slate frame is a period way of doing embroidery. Also using no frame or hoop is period. Today we’re using small hoops for your first project. The easiest stitch is the cross stitch. I have charted this little lion for your use. On the top, the image shows how I chart my designs. Putting numbers in graph paper helps me keep track of where I am. 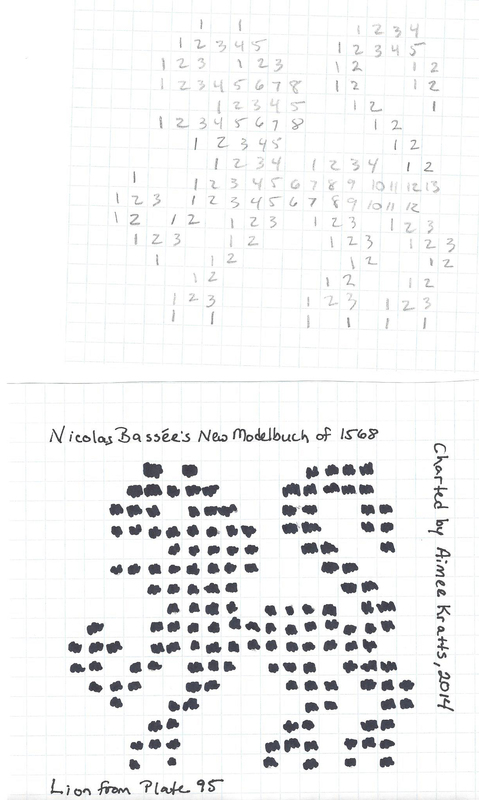 Some people like dots instead of numbers, so I made the same chart using black dots, shown below. When you do your counted cross stitch, each filled square in the diagram represents a cross stitch. 1. Start at the middle of the design and work outwards. 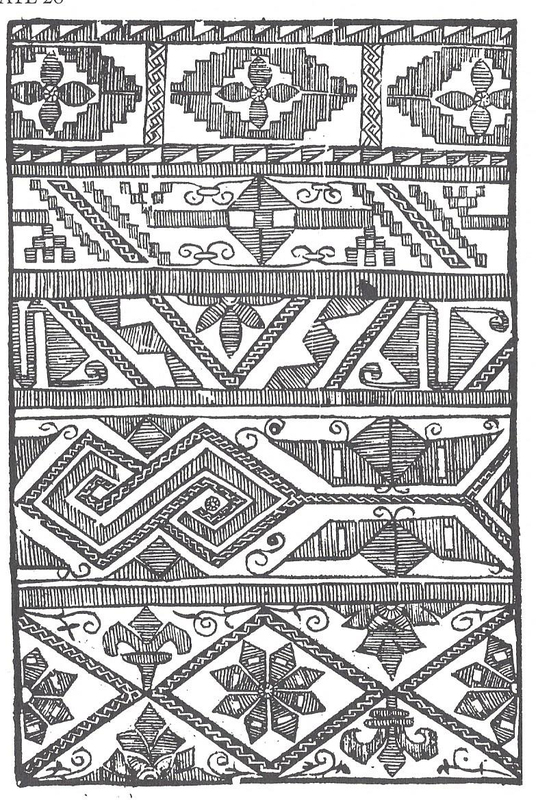 For example, the middle row of this design is the only row with 13 stitches. I started there and worked my way across the row and back again. Then I went down a row and embroidered the row with 12 stitches in it. 2. Work with silk thread if you can afford it. The embroidery is a lot easier with silk. DMC and any other type of cotton thread will stick a lot. Outline stitches were usually black thread on a white ground. Stem stitch and split stitches are outline stitches as well. The embroidery sample that you will work with is a portion of the design near the bottom of Plate 26. For this example, you will be working on a piece of linen that is not even-weave. You are not counting your stitches with any of the outline stitches, you are simply following the design drawn on the linen. Portrait of a Young Man with a Wreath of Carnations, c. 1550. Anonymous master (active in South-western Germany). Example of embroidery on the collar of a shirt. Anna Meyer, 1526 by Hans Holbein the Younger. I believe that this is a wedding portrait and quite unusual. 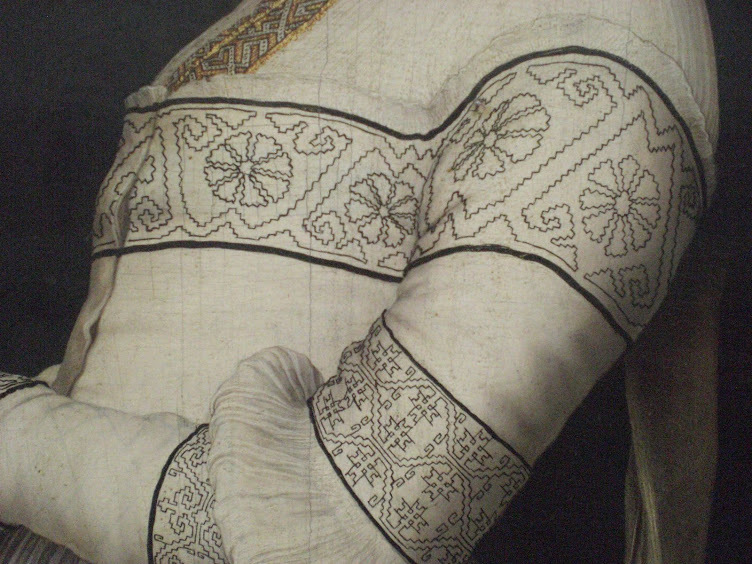 There are not oodles of portraits like this with embroidery on the sleeves of the outer garment. Portrait of a Bride by Lucas Cranach the Elder 1500-1506, Nuremberg, Germanisches Nationalmuseum. Example of an embroidered brustfleck between the young lady’s chains. 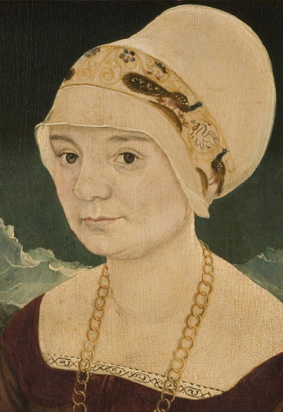 Portrait of a Lady by Martin Schaffner, 1520. Item#733. Philadelphia Museum of Art. Example of an embroidered head-covering. 2. Epstein, Kathleen. German Renaissance Patterns for Embroidery: A Facimile Copy of Nicholas Bassee’s New Modelbuch of 1568. Curious Works Press, Austin, Texas, 1994. 3. Lubbeke, Isolde. Early German painting 1350-1550. Sotheby’s Publications, London 1991.